ONE of Belfast’s literary giants, the award-winning poet Michael Longley, will take to the stage of the Lyric Theatre this Sunday (3 March) as part of a celebration of the city’s 400th anniversary. Recipient of a string of literary awards, including the T.S. Eliot Prize and the Queen’s Gold Medal for Poetry, the 73-year-old is celebrated for the beauty of his poetry’s compact, meditative lyrics. The esteemed poet will discuss his work with popular BBC Arts presenter, Marie-Louise Muir in the intimate setting of the Naughton Studio at the Lyric Theatre. The Lyric is hosting a series of City Conversations with well-known personalities about the impact Belfast has had on their life and work. 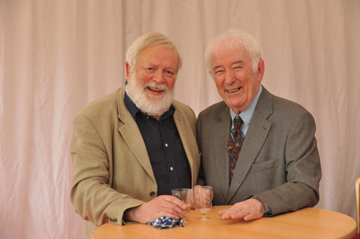 Michael Longley and Seamus Heaney at the Lyric Theatre in Belfast. (Photo by John Harrison/Harrison Photography). Architect John Tuomey, whose design for the Lyric Theatre was short-listed for the prestigious Stirling Prize, will be speaking about his award-winning practice on 21 April. Contemporary artist, Colin Davidson, the man behind the eye-catching portraits in the Lyric’s foyer and whose work has often been inspired by Belfast, takes to the stage on 12 May. His solo exhibition ‘No Continuing City’ focused on Belfast as it appeared from city centre roof-tops. Last but not least on 6 July playwright Marie Jones will be ‘in conversation’ with fellow actor/writer Dan Gordon to coincide with the return of her popular show, Weddins, Weeins and Wakes. Jones’ hit comedy is the last in a series of plays in the Tales of the City season that also includes the latest instalment of the ‘Billy’ plays by Graham Reid. Richard Croxford, Artistic Director of the Lyric Theatre said: “We’re no strangers to a conversation and a bit of banter in Belfast and so to complement our season of Belfast plays we decided to invite some well-known local personalities to talk about the influence this great city has had on their life and work.